SOURCES at a major defence conglomeration have confirmed plans to sail the navy’s biggest warship ever back into Portsmouth today. A spokeswoman from the Aircraft Carrier Alliance (ACA), which is currently in charge of HMS Queen Elizabeth, said the plan was for the 65,000-tonne behemoth to sail into the city’s harbour this afternoon. 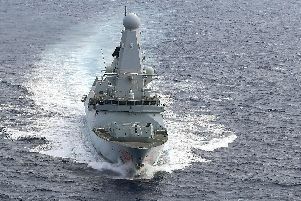 If all goes well, the mighty new warship will sail through Portsmouth Harbour’s narrow entrance just after 1.20pm. However, the ACA source said the homecoming could be called off right up until the final minute if wind and weather proved too dangerous. The ACA spokeswoman said: ‘The ship is ready to come into Portsmouth following a successful period of sea trials. The window for the entry is between 1.20pm and 2pm. ‘That’s when we will be ready to come in,’ the spokeswoman added. ‘We will do all that we need to do. We will then make a decision based on the weather. This will be Queen Elizabeth’s second time entering her home port. The £3.1bn, 280m ship visit arrived in August – with a rapturous welcome from thousands of people who lined the city’s harbour to wave her and her crew in. Queen Elizabeth is due to be formally commissioned into the navy on December 7. The ceremony will be attended by the Queen, high profile politicians and military top brass. HMS Queen Elizabeth will then undergo further trials of the F-35b Lightning II stealth jet next year. That’s expected to happen off the coast of America. The aircraft carrier’s main role, once operational, will see her responding to oversea emergency anywhere in the world, as well as continue to extend British military might. She will also support Nato operations across the globe.